This Fun Picture Puzzle is for Kids. This is very easy Picture Puzzle which needs to be solved very quickly. In this Puzzle Picture, there are two rows. One of these row contains number written from 0 to 9 and second row contains the letters written. However one of the number is missing and one of the letter is repeated. 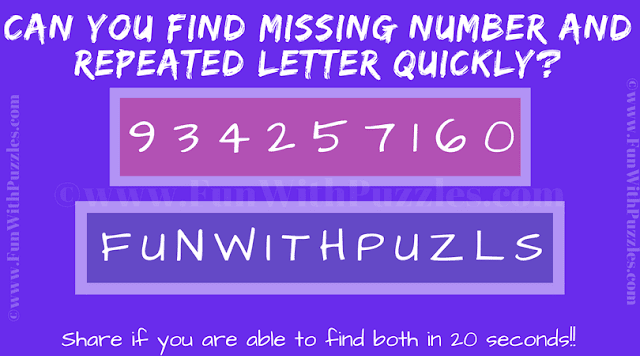 Can you find this missing number and repeated letter in 20 seconds? Can you solve this Fun Picture Puzzle in 20 seconds? Answer of this "Fun Picture Puzzle for Kids", can be viewed by clicking on button. Please do give your best try before looking at the answer. The Answer is 8 and U.